Whoa. The ending of Inception probably made more sense than this. Indeed. That gives you a very good idea how Hera will be doing in Arena, isn't it? It's not supposed to be tough, its telling a story about how she's destroying imperial supplies. They know everyone can auto through this anyway... It wouldn't matter if those were stormtroopers or whatever. 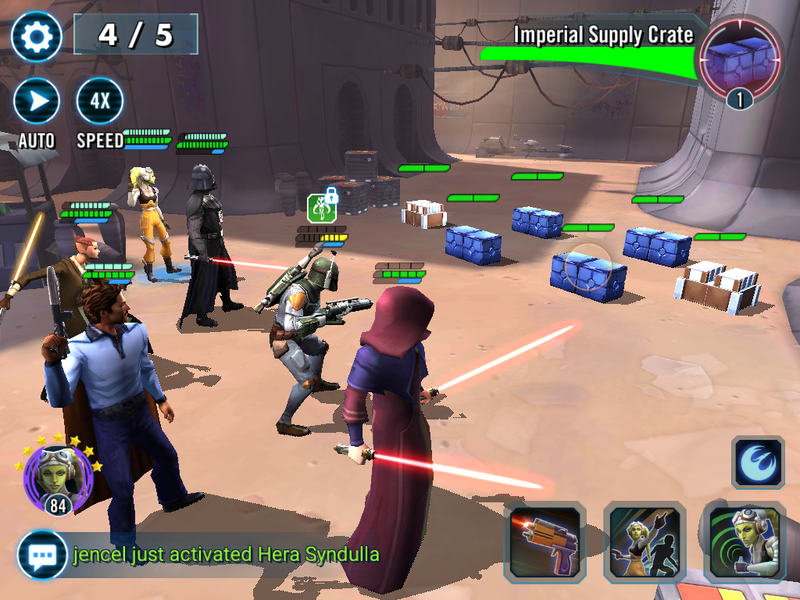 Boxes seems to be OP, look at how much damage Boba already took! Here a hint if you didnt get it done: Use Chirpa lead and shock all boxes with Palpatine!! The real question is, How is your Boba in the yellow? He only has a one-dot speed arrow mod, so the crates attacked first. What kind of attack? They jump on you or throw those books they store ? Guys. The secret trick is to bomb them up with mob enforcer. Those exploding crates then explode even more! Bobba be like, "I took some shrapnel for the team!" and that has to be the best comment so far. This. If a level 20 gr 3 can hit so much BF, I wouldn't like to see the other tiers. Don't think to win unless you got Zeta. Yes, but barely. The crates killed Boba Fett several times, but Bounty Hunter's Resolve kept resurrecting him.